Pink tones to help your journey as a professional photographer! 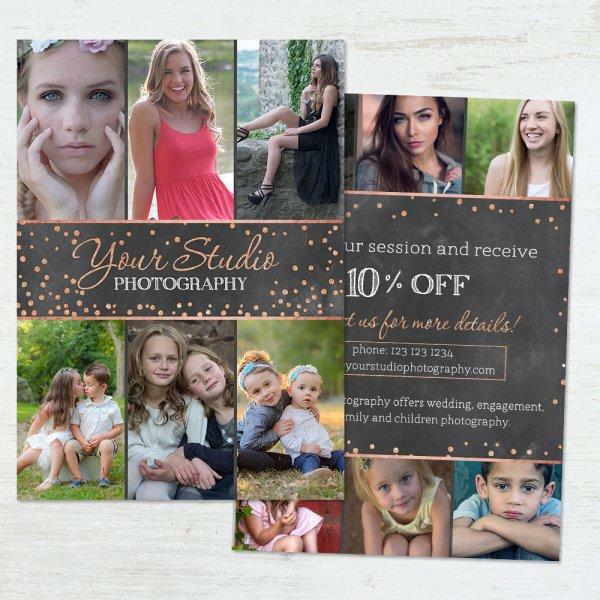 Looking for cute ways to promote your photography business? Check this card! Spread a word about your studio with these lovely promo card templates from Sleeklens. 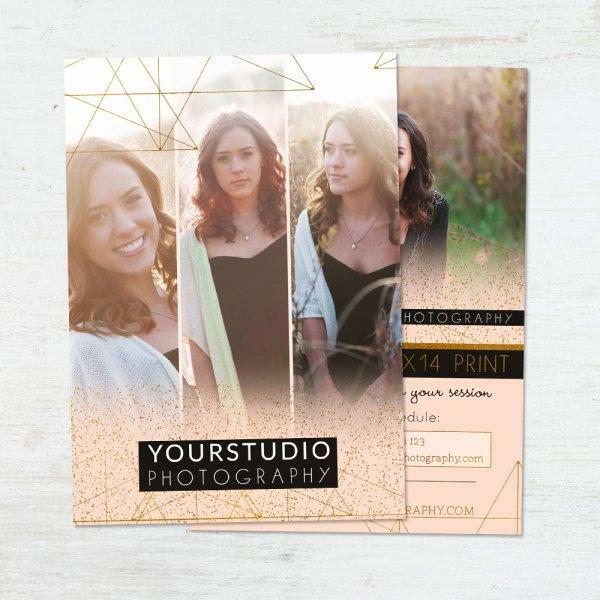 These templates are perfectly designed to make your marketing plans easier and cost effective and you can use them for all the different styles of photography. The ready-to-use templates offer unique backgrounds and colors which you can combine with your gorgeous images to leave everyone talking about your studio work. As a photographer, you understand and appreciate the power of images when it comes to communication. As such, we give you the chance to display your images in a way that is both unique and catchy. Having your existing clients talk about your business to their friends and relatives is one of the easiest ways for your business to grow and giving them promo cards to do it will definitely prove to be a powerful tool for success. This is one of the gorgeous promo card templates that will help enhance your professionalism and photography image as well. 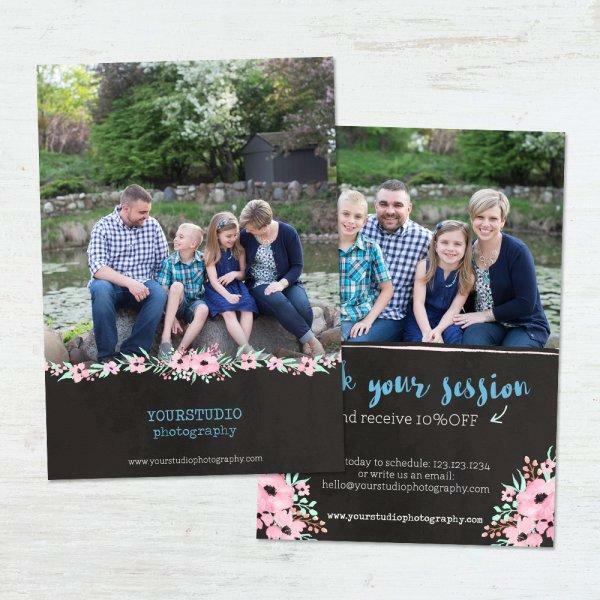 If you are looking for promo cards that help put a word out there for your business, this template will come highly recommended considering its customizable and you can clearly outline your message with ease. You can easily insert your studio logo and other business information with the help of the available features including clipping masks. Once you design your promo cards, you can have them printed in some of the big pro printing labs such as MpixPRO, WHCC and Miller’s among others. The template layout is already laid out for you and you can use it as-is. This template will make your advertising work easier and effective, thanks to its catchy effects and design. It is also customizable and you can change the wording to communicate your information as you would like to. You will receive a list of fonts which you can use to write your details. These fonts are freely downloadable and you can search for them easily using the names provided. The flat card template has a dimension of 18 by 13 centimeters thus giving you sufficient space to work with. The template has two file options; front and back, meaning you can write on both sides or add your images as you wish. The Photoshop template is clean and has an excellent professional look which will strike a chord with your clients thus helping grow your business. This yet another cool template which you can use to design your promo cards effortlessly. 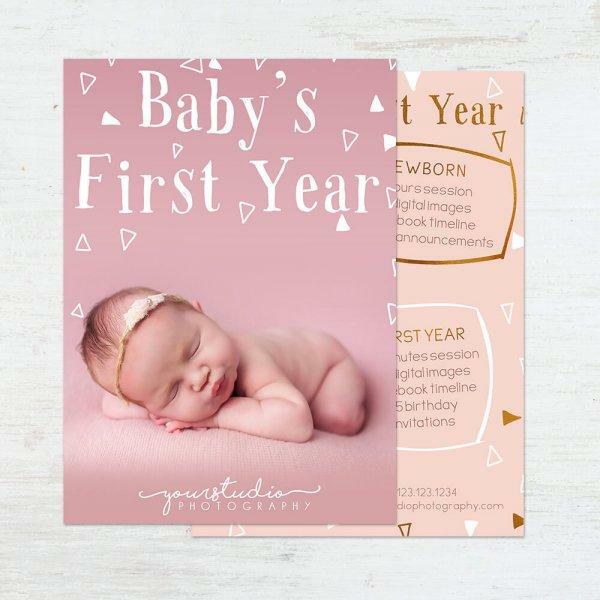 Everything is done for you and all you need is to give the layout a personal feel and look by adding your images, business info and logo as well. Nap Time promo card template has cool pinkish color shades which are unique as you target different categories of clients. It is both versatile and colorful, giving you the power to efficiently advertise your photograph in a cost effective campaign. The flat adobe Photoshop has a dimension of 18 by 13 centimeters and comes with some easy to use features including clipping masks which you can utilize when adding and editing your images. It also has 300 dpi Layered Photoshop PSD files which guarantee high definition effects on your promotional material. This 18 by 13 centimeter flat card template is also a great tool that will not disappoint. With Layered Photoshop (PSD) files of 300 dpi and two files (if offers front and back options), you can use it to design your advertisement material in a style that is both catchy and hard to ignore. The promo card template also has fully editable text which you can personalize using a number of fonts whose names are given in a list you will receive when you download the product. You can use Delightful Fantasy to advertise your upcoming mini sessions in a way that clearly displays your professional acumen and have everyone seeking after your photography services. As you purchase any or all of these templates, you should be ready to accommodate more clients who will be mesmerized by your work. Each of these templates is compatible with Photoshop CS+, Photoshop CC and Photoshop Elements 6+. You need to have any of these software versions installed in your Mac or PC in order to be able to use the promo card templates.